North Jakarta (Indonesian: Jakarta Utara) is one of the five administrative cities (kota) which form Special Capital Region of Jakarta, Indonesia. North Jakarta contains the entire coastal area within the Jakarta Special District. 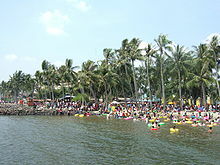 In North Jakarta, an area at the estuary of Ciliwung river was the main port for the kingdom of Tarumanegara, which later grew to become Jakarta. Many historic sites and artefacts of Jakarta can be found in North Jakarta. Both ports of Tanjung Priok and historic Sunda Kelapa are located in the city. The city, which had 1,645,312 inhabitants at the 2010 Census, has its administrative centre in Tanjung Priok. North Jakarta contains some of Jakarta's original natural mangrove forests. As the city has developed, some of this mangrove forest was converted into urban areas. However, a reforestation project aimed at planting mangroves within an area of 400 hectares was enacted in 2011 and was scheduled to be finished in 2012. The main goal of the project was to minimize abrasion in the coastal area, especially around the Pantai Indah Kapuk area. North Jakarta is bounded by Java Sea to the north; Bekasi to the east; West Jakarta, Central Jakarta and East Jakarta to the south; and Tangerang to the west. Laundry workers working at Ciliwung river in Pasar Baru, circa between 1915 and 1925. The present-day city of Jakarta grew from the area which is now North Jakarta. In the 5th century, at the mouth of the Ciliwung-Angke River, the development began with the port city Sundapura (now near Tugu, Jakarta and Bekasi), which was the main port for the Kingdom of Tarumanegara under the leadership of King Mulawarman. During the 16th century, the city, which covered only the area of what is now North Jakarta, was known as Jayakarta. The system of government in Jayakarta has been amended several times, including changes of rulers, and shifting borders of the administrative area. This area consisted of three forms of government: first, the city government which was controlled directly by the Lord of Jayakarta (the area of which is located in what is now the Port of Angke); second, the state government controlled by leaders inferior to the Lord of Jayakarta (the area of which is located in what is now Pasar Ikan and Kota; and third, the worldwide government (the area of which is located in what is now Tanjung Priok. At the beginning of the 17th century, the area was controlled by Chinese and other native people who later had to submit to the Dutch East Indies. The government system changed again in 1905. After the formation of Gemeente Batavia, the area around Jakarta Bay was transformed into Batavia District which includes the Onderdistrict (Subdistrict) of Penjaringan, Tanjung Priok, Meester Cornelis and Bekasi. Meanwhile, Tanjung Priok came to be under the control of Haven Directie Koninklijke Paketvaart-Maatschappij. When Japan entered into the region, the form of the government changed into Shiku (district level), and so North Jakarta was divided into districts such as Shiku Penjaringan, Shiku Tanjung Priok and Shiku Bekasi. After the formation of the Unitary Republic of Indonesia on August 17, 1945, Jakarta Bay was divided into several administrative regions, namely Kewedanan Penjaringan, Tanjung Priok and Bekasi. These three kawedanan are controlled by the mayorship of Jakarta Raya, which is a part of West Java. On May 28, 2014 the ground breaking of a new 12.5 hectare stadium was done to replace the old Lebak Bulus Stadium which was demolished for Jakarta Mass Rapid Transit project. The new stadium project cost Rp1.2 trillion ($103.2 million) and is equipped with a modern 50,000-seat main stand, 2 training fields and also includes a water park, a running track, a bike path, an exhibition hall and other recreational facilities in the surrounding area. The project is predicted to finish in late 2017. ^ iast (February 19, 2011). "2 Juta Mangrove untuk Pesisir Jakarta". id.wisatapesisir.com (in Indonesian). Retrieved February 26, 2011. ^ "Kota Jakarta Utara". IANN News (in Indonesian). Manan Foundation. Retrieved February 26, 2011. ^ "Wisata Pesisir" (in Indonesian). Pemerintah Kota Administrasi Jakarta Utara. Retrieved June 2, 2011. ^ http://www.desamodern.com (February 10, 2011). "WISATA PESISIR : 12 TUJUAN WISATA JAKARTA UTARA" (in Indonesian). Portal Berita Universitas Pancasila. Retrieved June 2, 2011. ^ "Joko Breaks Ground on Tanjung Priok Stadium". May 28, 2014. Wikimedia Commons has media related to North Jakarta. This page was last edited on 23 March 2019, at 21:20 (UTC).